Oil prices are rising Monday as Vladimir Putin commented that he expects OPEC to reach a deal on an output cap. 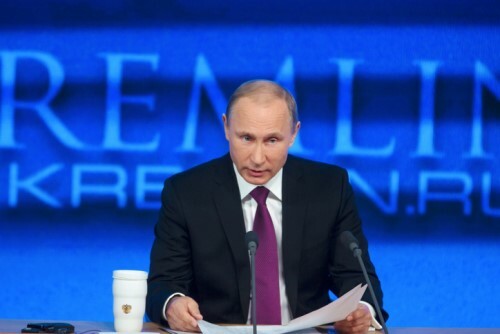 The Russian president said that he sees “few hurdles” to an agreement. Oil was up 1 per cent in early trading. Meanwhile, equity markets are mixed with some major Asian bourses closing with strong gains while some others, and most European indexes sliding. Shanghai and Tokyo led the gains for Asia while Sydney and Seoul were lower. South Korea’s market reacted to news that the country’s president has been linked with a corruption scandal. Japanese trade data showed weaker exports and imports while sales figures for supermarkets and convenience stores improved. European markets are awaiting the ECB president Mario Draghi, who will speak at the European Parliament later. Equities are trending lower despite the rise for energy firm stocks as political issues are weighed. France’s former president Nikolas Sarkozy is out of the running to return to the presidency while German chancellor Angela Merkel said she will seek re-election. Facebook said it will expand its UK operations by 50 per cent next year, following a recent announcement of new investment in the country from Google. The announcements have been seized on by pro-Brexit influencers as a sign that the country will continue to thrive outside the EU. The global economy will benefit from continued stimulus from Japan and the Eurozone but that could be tempered by the Fed and political uncertainty. That’s according to a client note from Goldman Sachs. Included in the forecast is expectation that emerging equity markets in Poland, Brazil and India could be good due to their limited exposure to China’s growth or US trade policy.